Eating cold things on hot days will never get old, and this salad is becoming a new classic in that genre around here. I found the recipe in Deborah Madison’s Local Flavors , which is specifically geared toward cooking throughout the year from farmer’s markets. The idea definitely struck a chord with me, since that’s how we eat down here, more or less, in the absence of Berkeley Bowl, which is like a farmer’s market on steroids. Like all the steroids that have ever been produced on earth. Although that love affair will never end, I have really enjoyed going to the market every week and getting to know the names and faces of the people who grow our (glorious!) food. And it’s really fun to exult with them over a bumper crop of juicy nectarines or nutty arugula. But I digress. 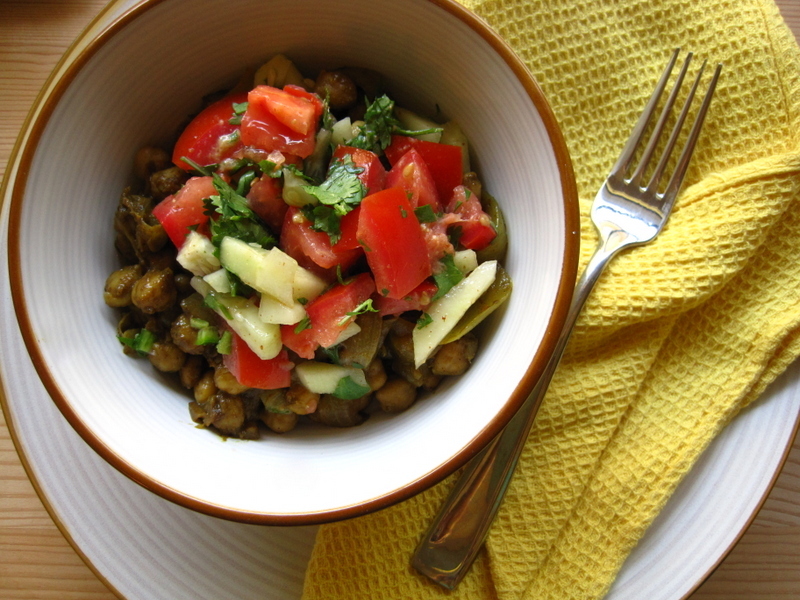 This salad begins with chickpeas in an aromatic mix of spices, including garam masala, which always takes my breath away. While it’s stewing away, you can start chopping the extra chunky salsa-like topping. 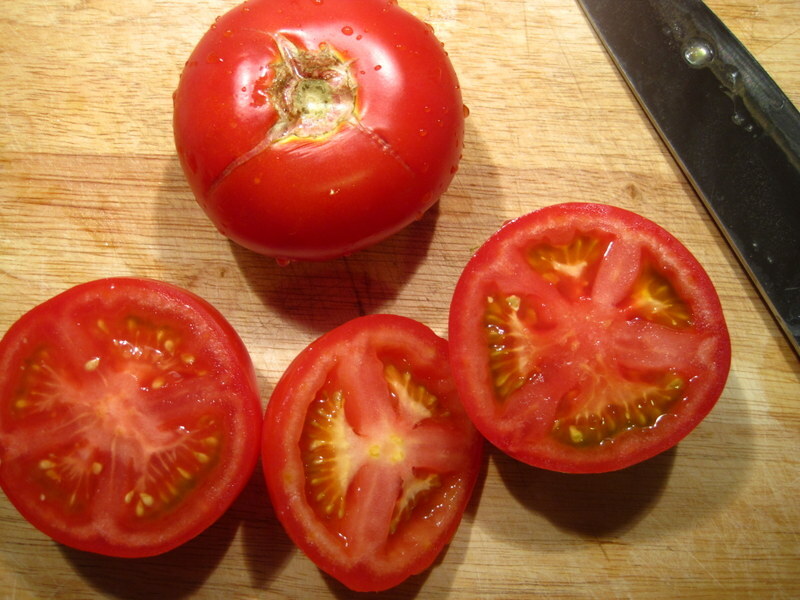 Of course, you start with tomatoes. 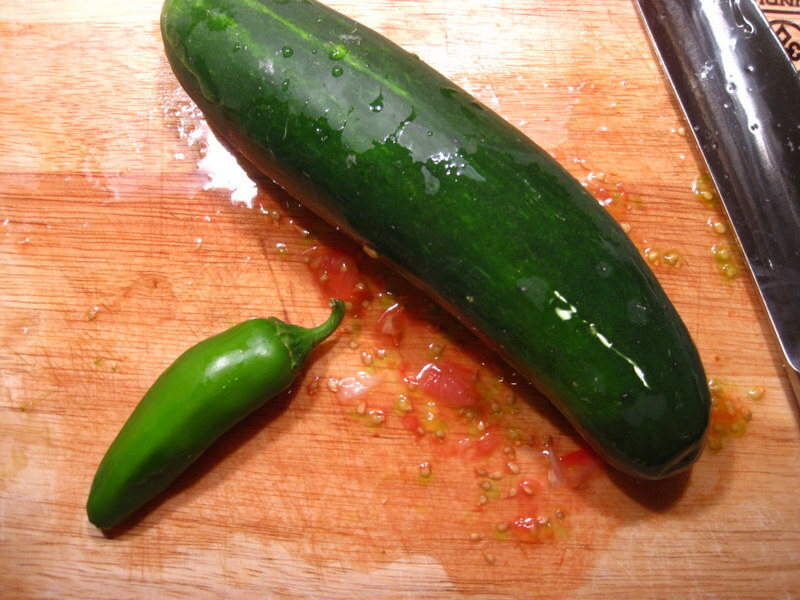 And then toss in a pepper and a cucumber. This is what it’ll look like when it’s all done. Beautiful, crunchy, and magnificently cold. All that’s left to do is slather the salsa on top of the chickpeas and enjoy! You’ll get a taste of rich spices and fresh garden bounty in every bite. If the summer must be fleeting, at least it is delicious. -Heat the oil in a large skillet and add the onions. Cook over medium heat until golden, 12 to 15 minutes, stirring occasionally. Add the dried spices and cook one minute more. 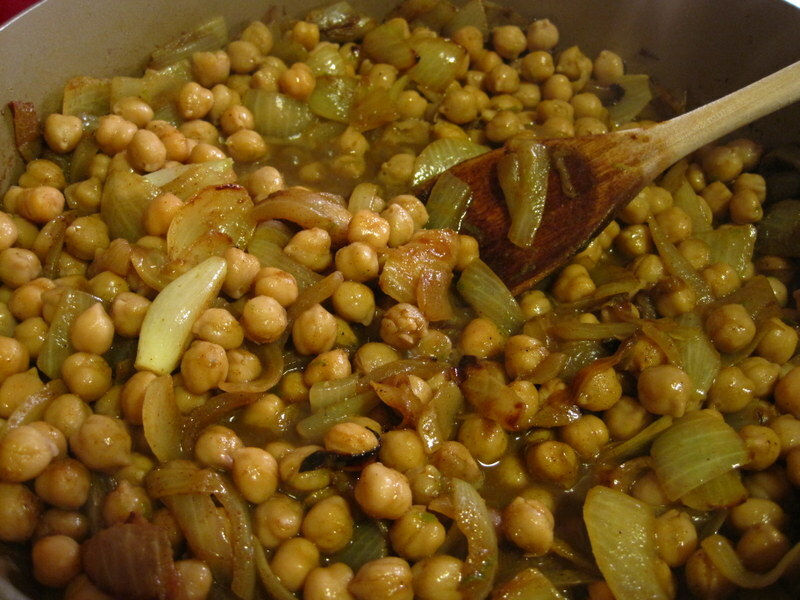 -Add the chickpeas, one c of water and one Tbsp of the lime juice. Cook until most of the liquid has evaporated, about 5 minutes. Taste for salt, let cool to room temperature and place on a platter or in individual bowls for serving. 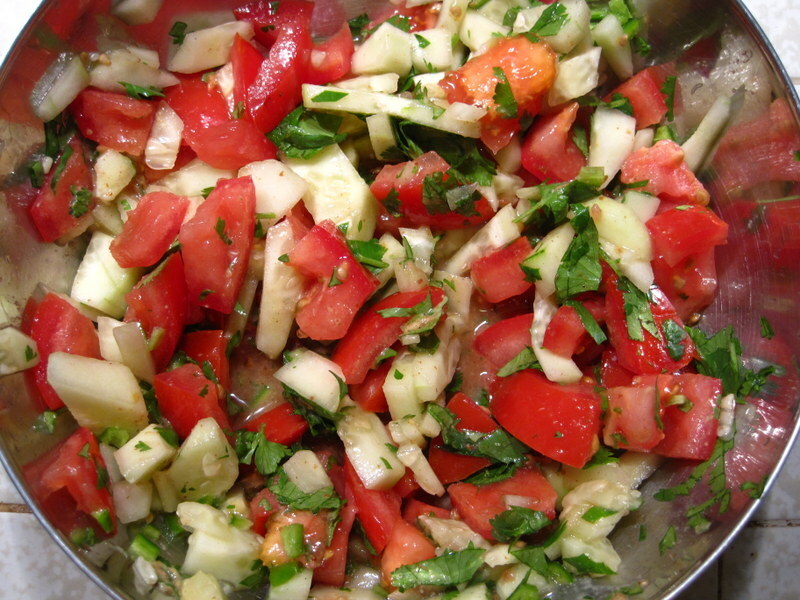 -To make the salsa, combine tomatoes, cucumber, chile, cilantro, and mustard in a bowl with the remaining lime juice. 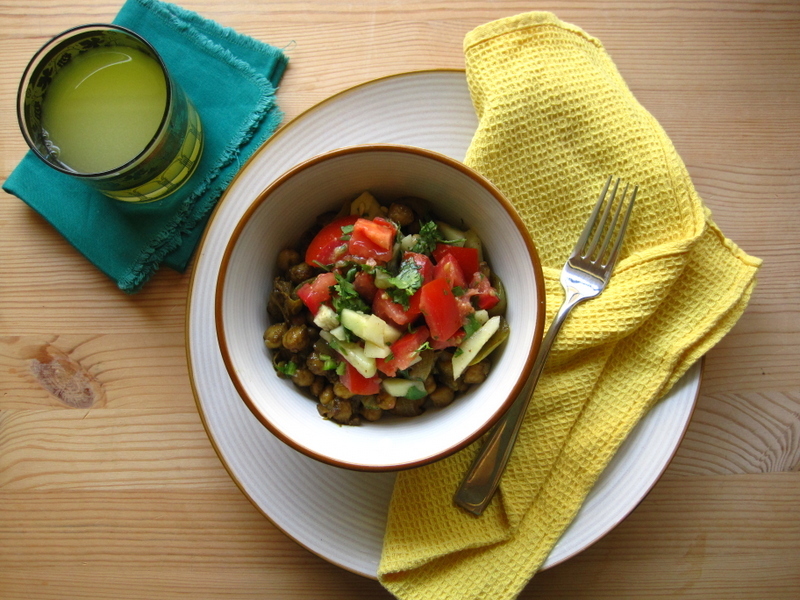 Spoon over the chickpeas and garnish with lime wedges. MMmmm! This looks like perfection! I will definitely make it! I was thinking you would like it!